A continuation of my earlier post on the afternoon I spent at Lemnos Labs, a hardware incubator in SOMA. So how does this relate to food? The food preparation industry is one that is ripe with “unpleasant labor.” And Momentum is initially targeting one specific food-related task which occurs all over the world: hamburger assembly. 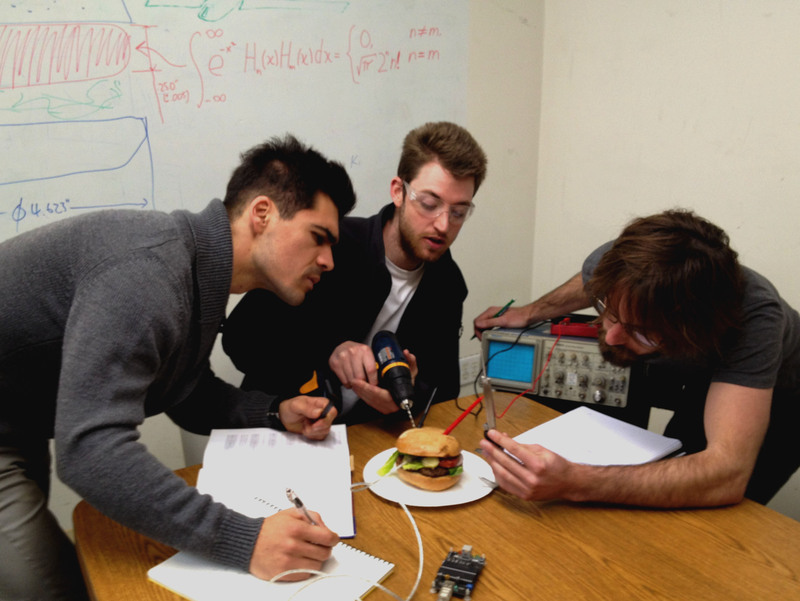 They’ve built a robotic machine which can assemble hamburgers rapidly, consistently, and with a great degree of customization. The product will dramatically reduce labor costs, giving smaller burger joints a chance to be cost-competitive if they choose to source organic and grass-fed beef and organic condiments. The machine also enables restaurants to use whole ingredients without dramatically increasing costs. For example, a meat grinder is an easy add-on which would enable users to bypass the frozen additive-laden patties that are so ubiquitous in favor of actual 100% beef from a single animal. We talked about making the machine physically transparent so that customers can actually see the whole foods get ground, chopped and assembled into their meal (just how everyone loves watching In-N-Out employees make french fries out of real potatoes…) If the goal of the foodie movement to connect customers to their food, I see a ton of alignment. While it’s unclear at this point if the company will adopt the sustainable ingredient angle that I’d love to see, there’s no denying this product will enable restaurateurs to pursue quality at a competitive price point. Imagine the implications of an organic hamburger chain serving marginalized consumers at a competitive price in communities that previously only had a McDonald’s? While a burger is still a burger, a burger made from all-natural whole ingredients is a vast improvement over the heavily-processed fast food product that contains, on average, meat from “a thousand or more cattle from as many as five different countries,” according to Eric Schlosser. Although consumer reaction is important, the main focus of the Momentum team is identifying their target market. Alex, Momentum’s President, explains, “determining our target market is our main problem right now and we’re excited to implement a true tech startup’s take on the QSR industry. A lot of industries were disrupted by tech startups and we hope to be an example of that.” I’m excited to hear more from this innovative team. hey there and thank you for your info �C I’ve definitely picked up anything new from right here. I did however expertise a few technical issues using this website, as I experienced to reload the site lots of times previous to I could get it to load correctly. I had been wondering if your web host is OK? Not that I am complaining, but slow loading instances times will very frequently affect your placement in google and can damage your high quality score if advertising and marketing with Adwords. Well I’m adding this RSS to my e-mail and can look out for much more of your respective interesting content. Ensure that you update this again very soon. I’ve been exploring for a little bit for any high-quality articles or blog posts in this sort of area . Exploring in Yahoo I ultimately stumbled upon this website. Reading this information So i’m happy to show that I’ve a very just right uncanny feeling I came upon exactly what I needed. I such a lot for sure will make sure to do not fail to remember this website and give it a look a continuing basis|regularly}. My spouse and I stumbled over here coming from a different website and thought I should check things out. I like what I see so now i am following you. Look forward to looking over your web page repeatedly. magnificent put up, very informative. I wonder why the opposite experts of this sector do not understand this. You must continue your writing. I’m sure, you have a huge readers’ base already! cheap youtube subscribers Lowest Rates Finest Assistance. That’s a posting full of inghsit!